Our company is called Nowstalgic Toys, a specialty toy company that focuses on reviving original brands (Super Elastic Bubble Plastic, Squirmles) from the 70's/80's. We also have developed our own "toys of the future" that utilize apps and Augmented Reality. Magic Light Trick: Throw light from hand to hand with Bright Bugz. It comes with a set of lights that you fit on a finger of each hand. Then press the button to make the light appear and let go to make it disappear. It comes with multiple adjustable sized bands. It also comes in 6 different colors: Pink, Green, Blue, Yellow, Red and White. Make it look like you throw it into your phone using the companion app. Then view 4 sides of the bug using the 3D HoloBeam. 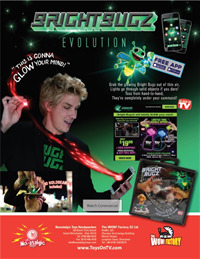 As Seen On TV Product: There were commercials running on Cartoon Network, Nickelodeon, Disney and ESPN. 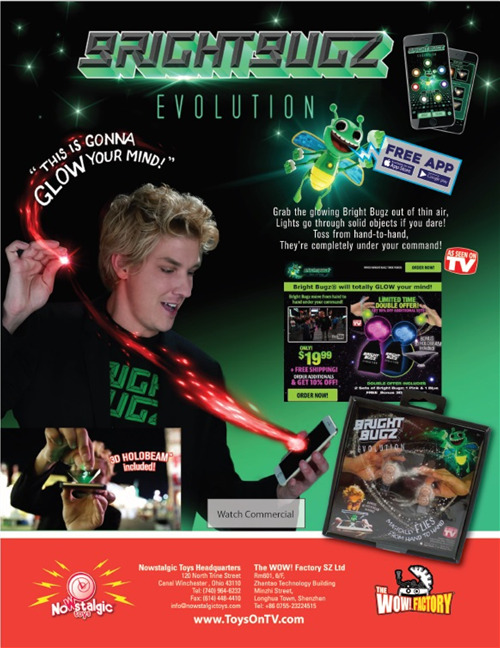 We've also worked with Social Media Influencers on special promotions with the Bright Bugz.